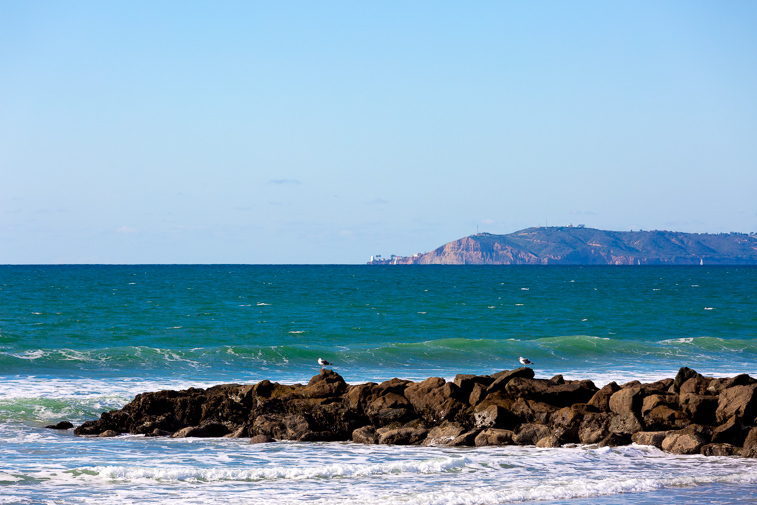 Spend your days enjoying the endless ocean views of the shimmering Pacific Ocean. 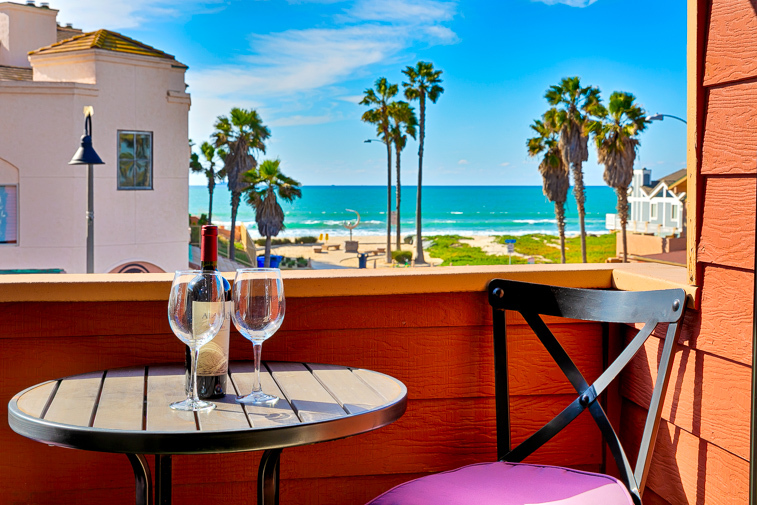 You are just steps from the beach and attractions in world famous Imperial Beach. Enjoy sunsets on the beach just steps from the house! 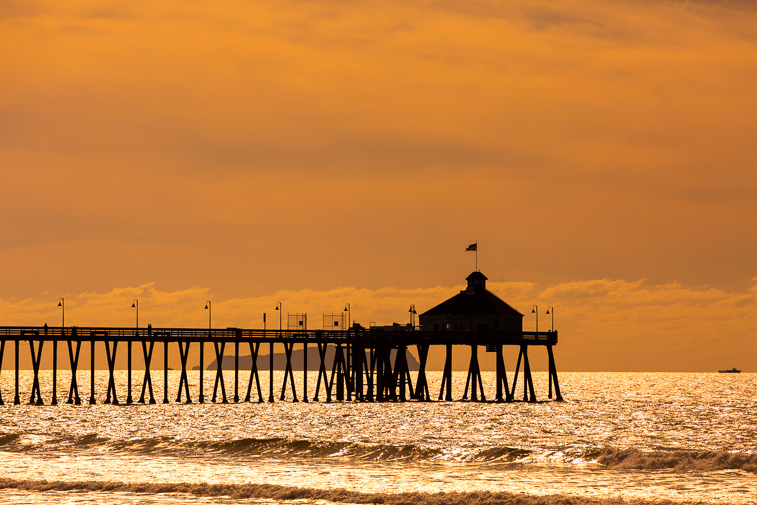 You will be able to watch as the sun sets over the Pacific and the Imperial Beach Pier. Ocean view 2nd floor balcony easily accessed via sliders in the great room. 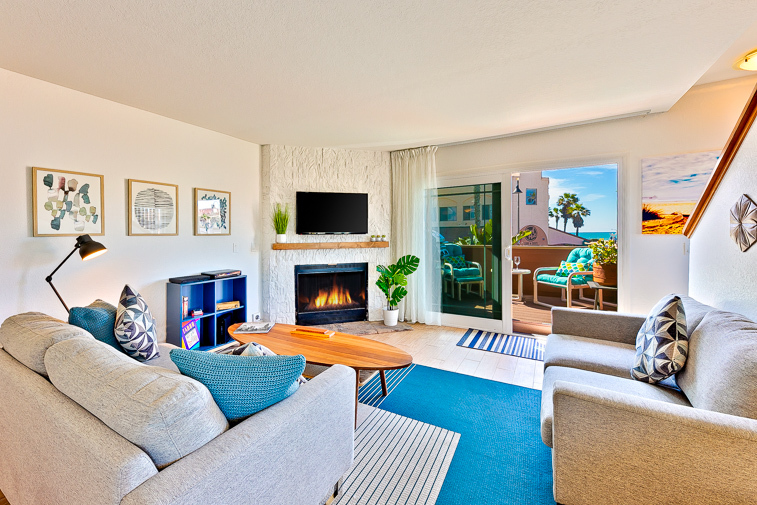 Beach chic living room is the perfect place to enjoy a fire or the flat screen TV before - or after - your day's adventures. Lots of comfortable seating near the kitchen so everyone can be together. 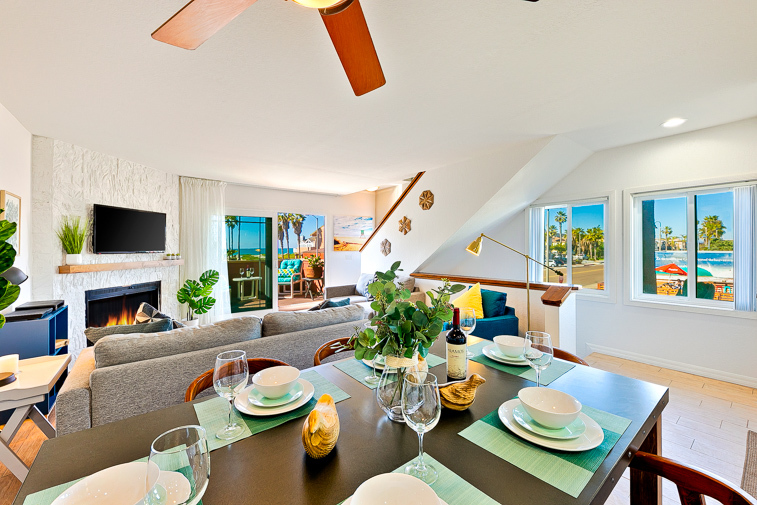 Comfortable dining area for 6 with a ceiling fan to keep everyone comfortable. 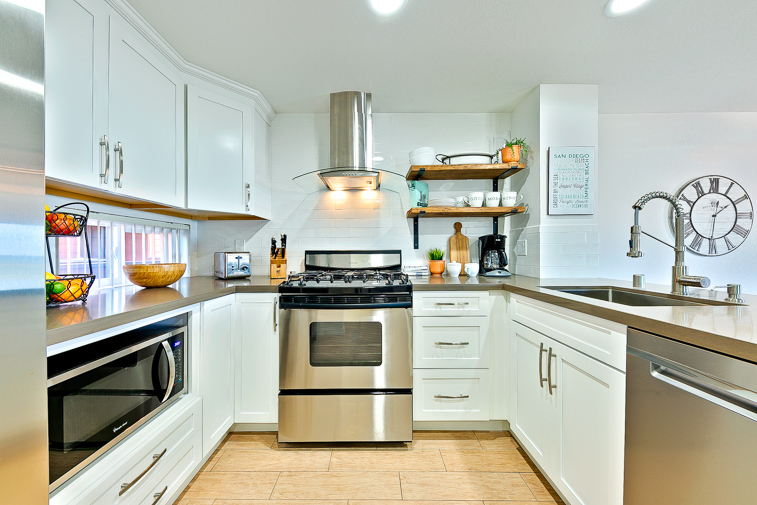 Kitchen has everything you need to create your culinary desires! 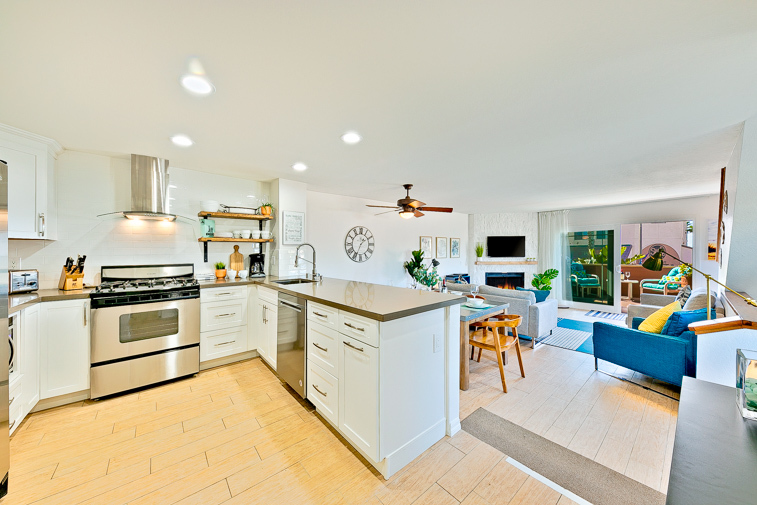 Fully-modern kitchen with everything you need to create meals and snacks for all Half bath right off the great room for your convenience. 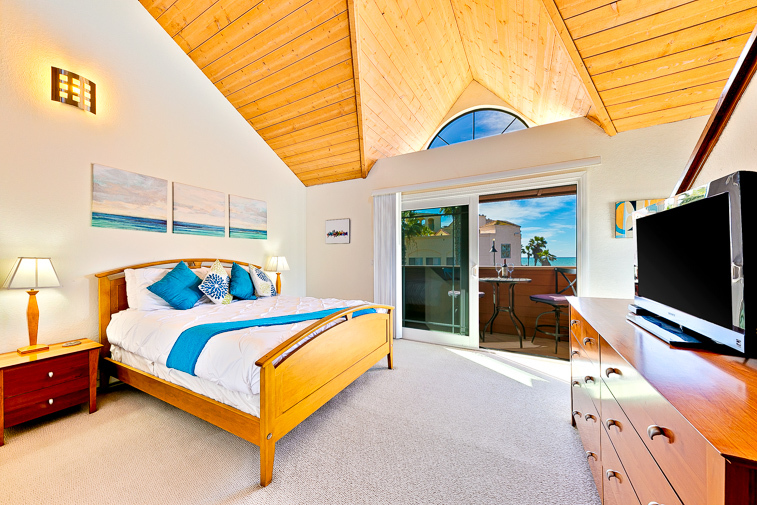 Queen master bedroom with slider access to outside seating area - a perfect place for an evening libation. 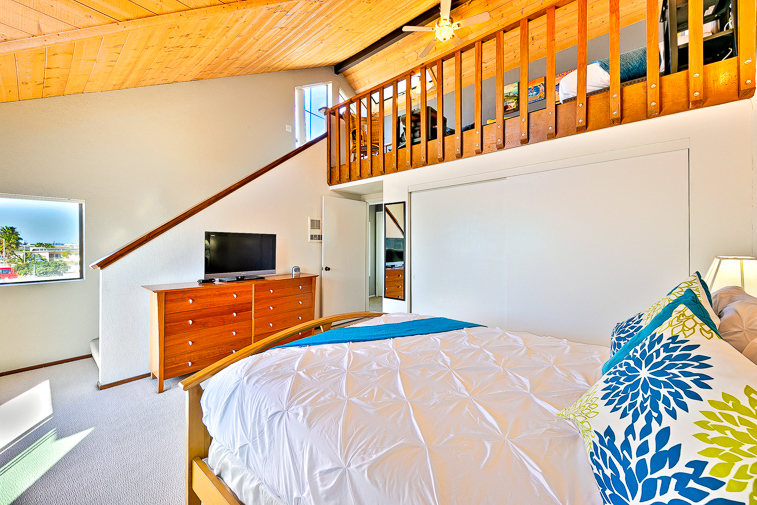 Another view of the 1st queen bedroom looking up to the loft bedroom. 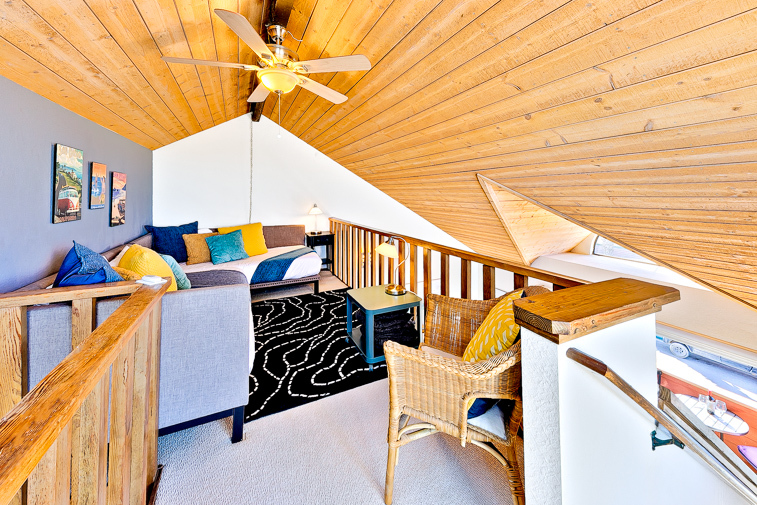 3rd floor loft with two twin beds- with a fan to keep the temperature comfortable. 2nd queen bedroom with slider access to a small balcony. Full modern bathroom with tub/shower combination. 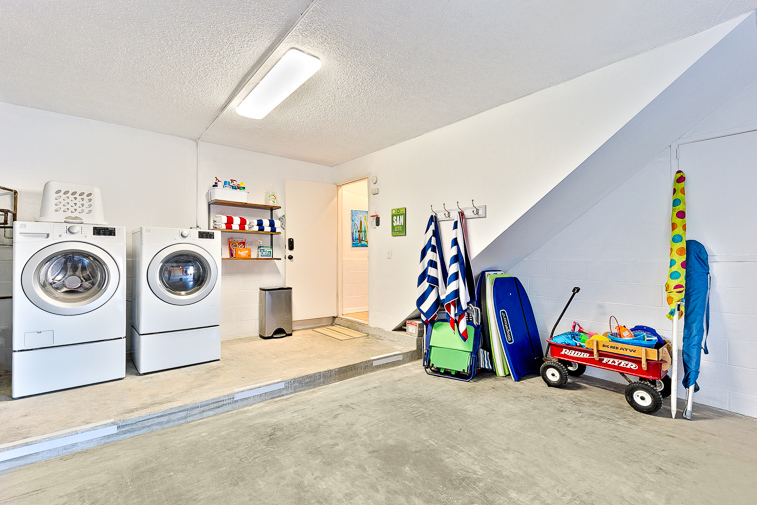 Private garage for unit that is stocked with everything you need for your day at the beach. Everything about this great room says inviting and comfortable - enjoy! Bright, cheerful, and inviting - smile then enjoy to the fullest. Just a half block from the beach and the shimmering Pacific. The moment you open the front door at Ocean Breeze, you will enter vacation mode as you take in the calming view of the Pacific, erasing all the stresses of the world. This gorgeous 1,232 Sq. 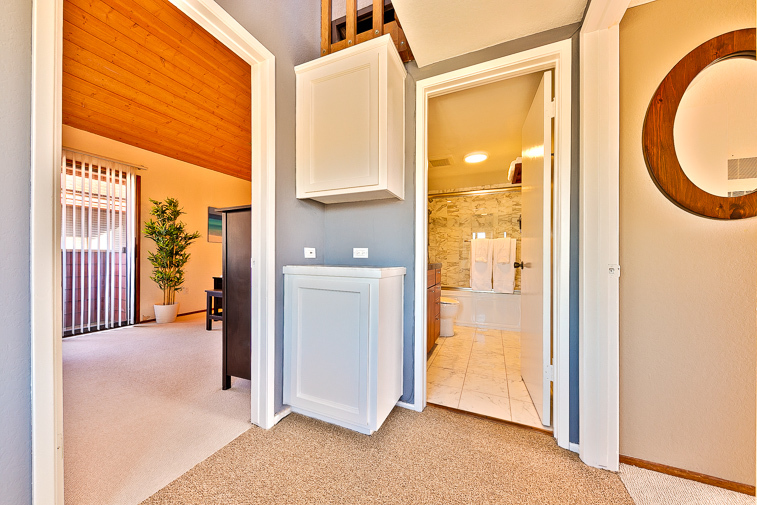 Ft. three level, two-bedroom, 1.5-bath townhouse in Imperial Beach also has it all! 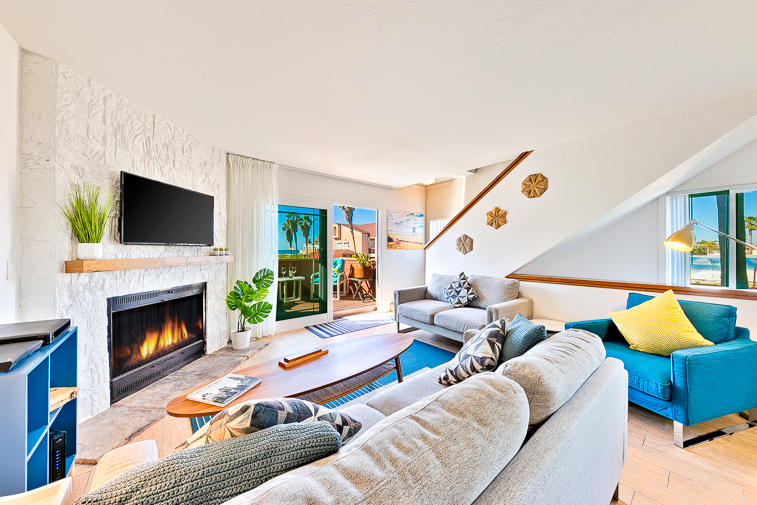 The bright and airy floor plan provides terrific beach views and cool ocean breezes in a spectacular corner unit at Seacoast Villas, just across the street from the beach. The main floor has fantastic ocean views from the modern, fully stocked kitchen, a dining room that seats 6, and the newly updated beach chic living room area with a flat screen TV and a gas fireplace (for those rare cool evenings) and lots of comfortable seating where you can relax and enjoy it all. 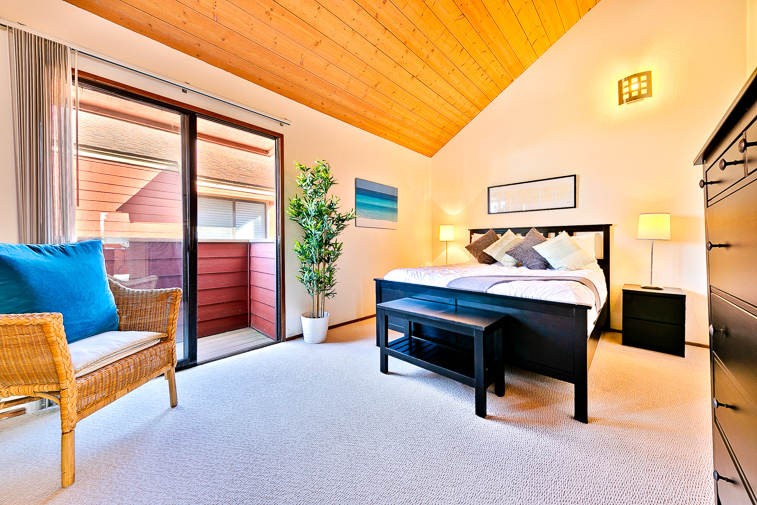 Open the sliders, step out on your ocean view balcony and flood the house with the cool ocean air. 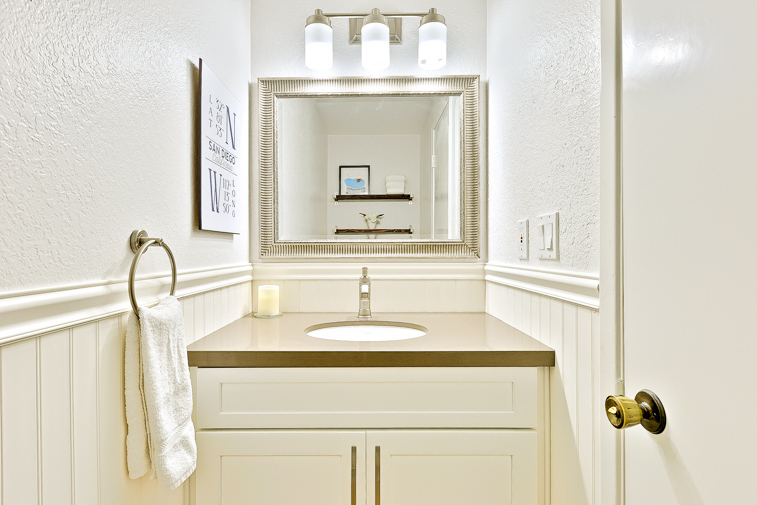 You'll also find a convenient powder room on the main floor. 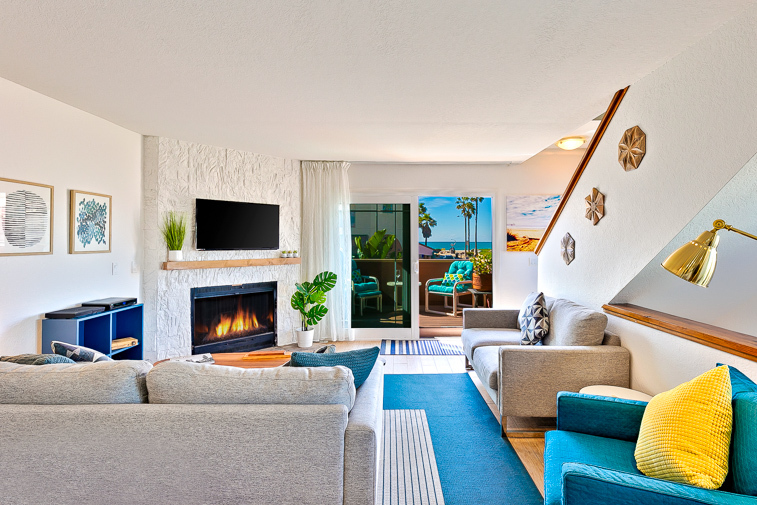 You'll be able to stay connected in your "home away from home" -- Ocean Breeze has super high-speed Wi-Fi Internet and Premium Cable with on-demand streaming of your favorite episodes and movies, including HBO, Showtime, and Cinemax. The state-of-the-art remote control allows you to search for programs or channels using voice commands -- you won't have to study the channel line up - just search by voice for the channels and programs you want to watch. 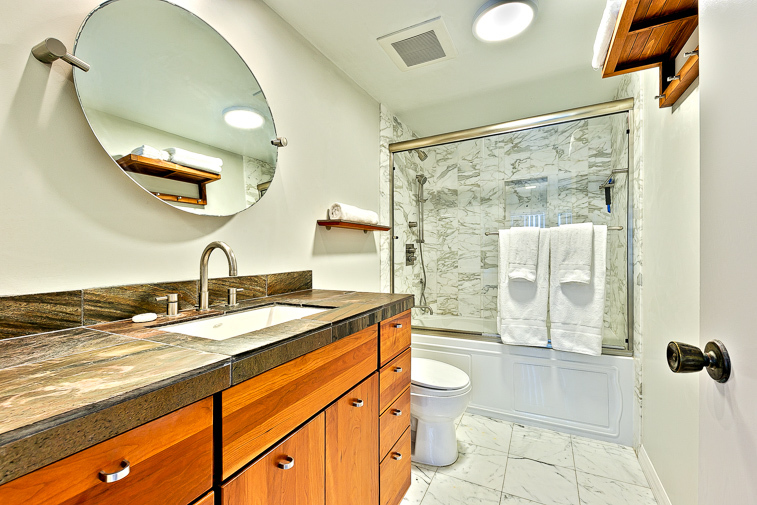 Upstairs, you'll find two bedrooms, each furnished with a queen bed and the main bathroom with a luxurious marble tiled shower/tub combo. 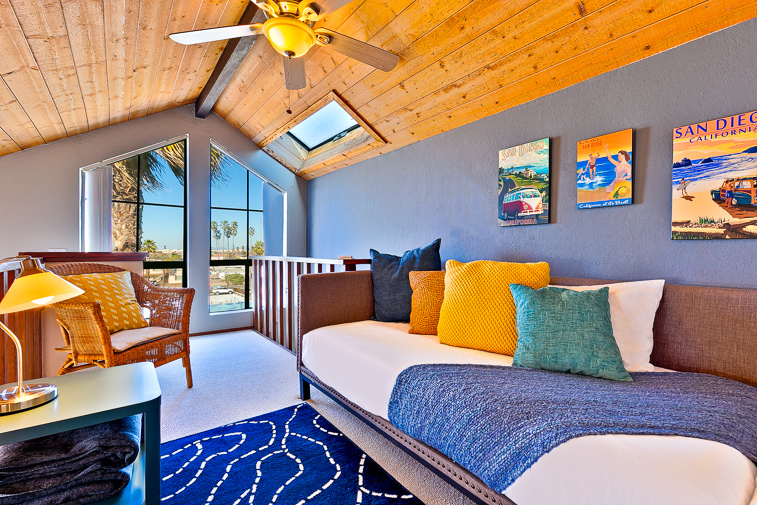 Above the master bedroom is a sleeping loft with two twin beds, so this home comfortably sleeps 6 in beds. 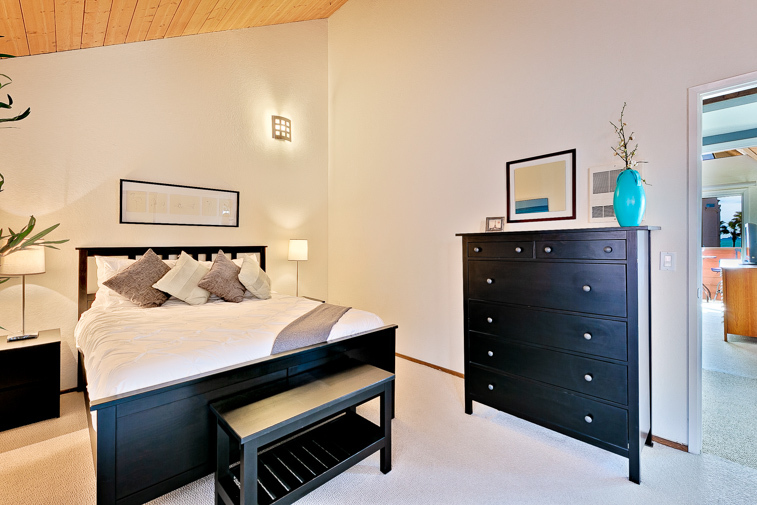 All bed and bathrooms are also furnished with a generous supply of premiere linens for your ultimate comfort. Guests will also have the convenience of off-street parking - in a private, secure garage - equipped with a new front load washer and dryer. 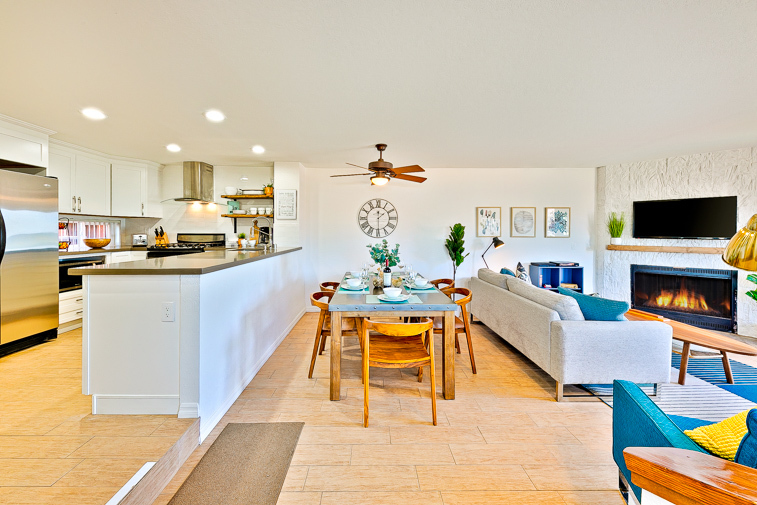 Ocean Breeze is located in a quiet, low-key neighborhood so you might be surprised to find two dozen restaurants and coffee shops, along with a handful of convenience stores and gift shops, within a 10-minute (1/2)-mile walk along Seacoast Drive or Palm Ave. There is a Farmers Market held every Friday at Pier Plaza with farm fresh produce, prepared foods, flowers, gifts & souvenirs. A little further away are grocery stores, banks, pharmacies and even more restaurants. 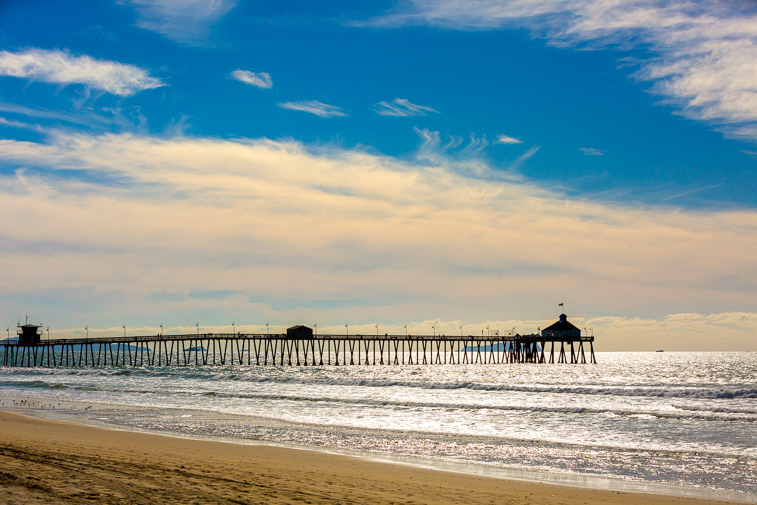 Imperial Beach is one of the last remaining, “Classic Southern California” beach towns -- great for families with kids or those wanting to relax in a low-key environment without a worry in the world. 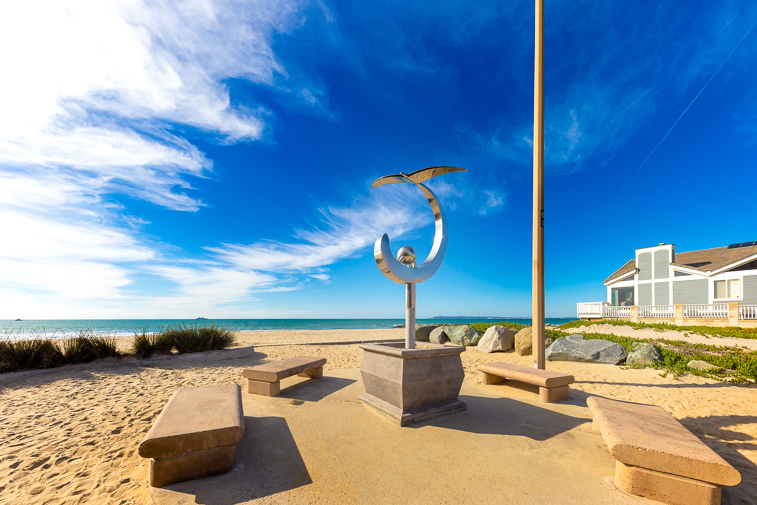 Walk along the beach collecting shells and sand dollars – or stroll along Seacoast Drive for a walking tour of some pretty cool public art installations. Join a game of beach volleyball or grab an ice cream cone and meander out along the wooden pier to watch the surfers and locals fishing for dinner. Ultimately there is no better place to spend lazy days sunbathing or building sandcastles, and then simply basking in relaxing evenings admiring a gorgeous sunset over the Pacific. Due to the moderate coastal climate this home (like most in this area) does not have air conditioning. This 3-story home does not have an elevator. This location was in a beautiful location near Imperial Beach. Quiet neighborhood. 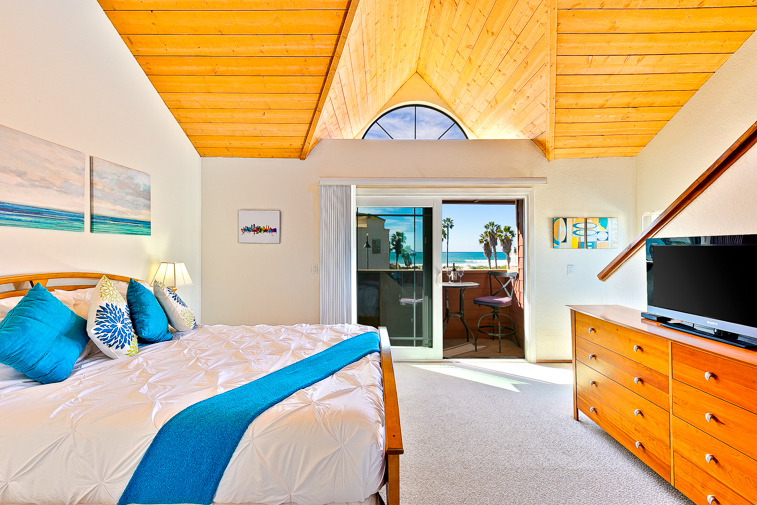 The house had 2 balconies facing the beach and we could leave the windows open all day to enjoy the ocean breeze. Walking distance to pier and great local restaurants. We were driving rental car and they had garage to park car which made us feel safe but plenty of parking around property. Would definitely consider staying here again. Very clean, newly remodeled. 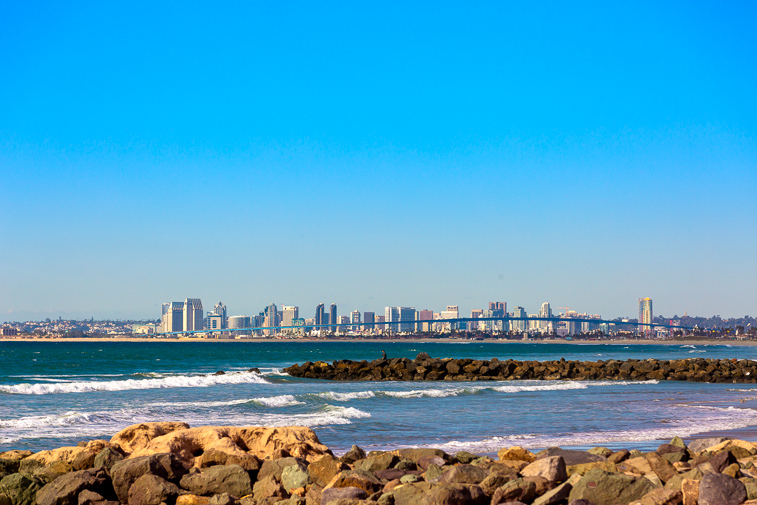 We enjoyed being within walking distance of the beach, fun zone, and ferry to Balboa Islsnd. - Reviewed By Kathy S.
This property was awesome. My family enjoyed our stay. Great accommodations. 2 bedrooms so very private. Beautifully decorated. My favorite part was how close to the beach it was. Lying in bed with sliding door open listening to the ocean waves. Very quiet neighborhood. Local restaurants walking distance. Would definitely stay here again and highly recommend it. Each room of this house was so unique and beautifully decorated! The home was spotless when we arrived which allowed me and my family to stay more comfortably. There are 2 astonishing balcony views of the ocean, and it was only a 1-2 minute walk to the beach! 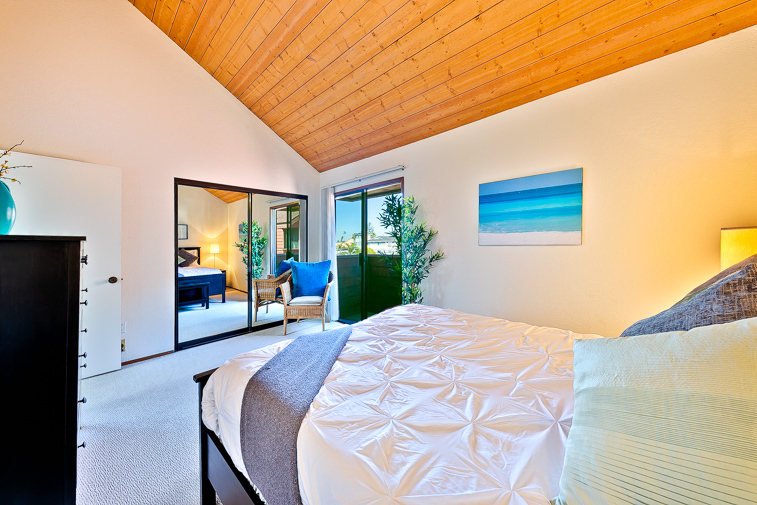 Lots of mirrors and windows(with blinds)allowing the home to feel more open and spacious. Throughout the day and night you can hear the soft sounds of the ocean waves. 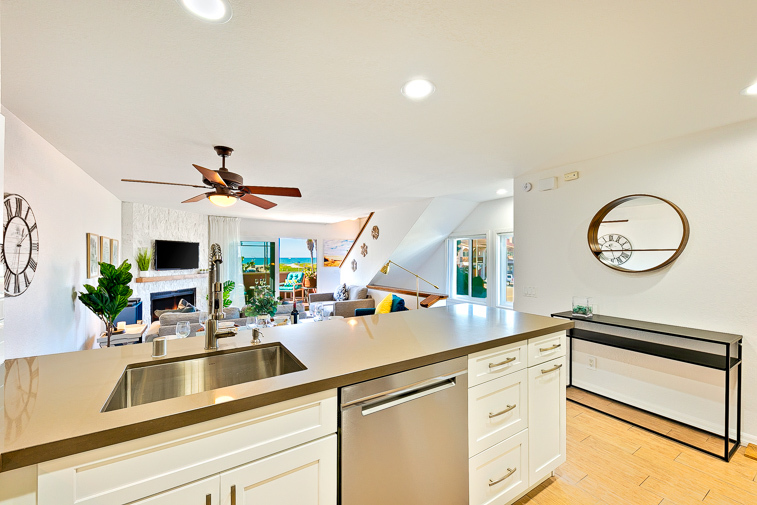 This home is right in the middle for all attractions in San diego and has amazing restaurants to attend right in front! I feel the owner did a tremendous job supplying for our needs and necessities. I would definitely recommend to family and friends! - Reviewed By Nicole C.
We spent 5 wonderful days in Ocean Breeze -- the house and the location were perfect for our "girls getaway". Ocean Breeze was nicely furnished and stocked with everything we needed. We especially loved the wagon (filled with beach chairs, towels, and umbrella). There were so many restaurants nearby, from the high-end Brigantine for seafood, and Verandina for Italian, to the more casual, (IB Tacos, Imperial Thai, Katy's Cafe and Luigi's Pizzeria) and all the food stands at the Friday Farmer's Market - all within a short (less than 1 mile) walk. The beach vibe was laid back and casual, a stark contrast to the crowds and congestion in Mission Beach, Pacific Beach or Ocean Beach. There were several grocery stores and plenty of convenience stores nearby. We loved walking across the street each evening to experience the spectacular sunsets, seeing the ocean views from almost every room in the house (we could see the beach from the kitchen, dining room, living room, and master bedroom), and enjoying the refreshing ocean breeze. We can't wait to return! We enjoyed the place, location, hosts response time and rectifying 2 minor issues was exceptional. This place was a wonderful place for our family to vacation! They had a lot of beach toys, boogie boards, umbrella, which was so convenient for us and the kids. Everything was laid out in a book when we arrived as well so it was very easy to figure out how to get settled. There was some water on the floor but they responded immediately and were able to get the situation promptly fixed. The only gripe we have is that there wasnt an air conditioning. We d dont see anything about that when we booked the condo, maybe an over site in our end but it was difficult to adjust to the humidity. In our last full day my son got an ear infection and we were at an urgent care all day. We were exhausted and asked to check out later so we could get some more sleep before the long car ride. They were nice enough to allow us an extra hour which we really appreciated. We would definitely stay here again! We highly recommend their condo. It is just walking steps to the beach! And another great convenience is that a great coffee house is just a few steps away as well. Great property, great location, underground safe parking, highly recommend. The condo was exactly as pictured including the awesome view from 2 patios. Pros - super comfy memory foam beds, the view, double secure parking in your own garage under the condo, the laid back small town feel of IB, and yummy mom and pop type restaurants just a few steps away. Katys Cafe for breakfast and stromboli from Pizzaria Luigi. Yum! Con - ( not really a con to me) the beach in IB wasnt as popular as the beaches a little farther North and so the whole beach front vibe is very low key including the night life if you are into that. We actually really appreciated that the streets were quiet at night, because our favorite part of the condo was throwing open the patio doors and enjoying the Ocean Breeze! There didnt seem to be any bugs in IB, yay! We were visiting my son who is stationed on North Island and this location was very convenient because you didnt have to deal with the bay bridge and it is very close to beautiful Coronado. We would definitely stay here again! Thank you guys for all the quick responses and the amazing place! The view was awesome! Amazing view! And amenities! Place was better than I expected and would return! We had a great trip! This was a great property with awesome location. Very comfortable furniture & beds. Very clean & lots of cooking utensils & pots/pans! We will definitely be back as our daughter lives in Imperial Beach! Our stay in the Ocean Breeze Condo on Imperial Beach was beyond wonderful, the rental had all the comforts of home and was beautiful inside and out. We enjoyed our stay so very much! The view of the ocean from our living room and bedroom deck was great and listening to ocean as we fell asleep with doors open was beautiful! 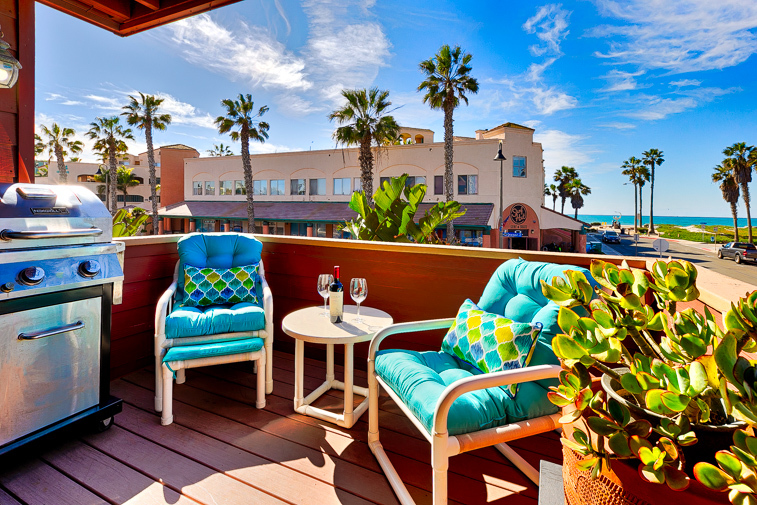 We will definitely look into your rentals when we are booking our next vacation to the San Diego area! Thank you for a wonderful stay! Absolutely recommend, and look forward to going back. Perfect view of the beach from our balcony. Beach Just across the street. So many fun things to see and do within walking distance. Couldnt have asked for more. SeaBreeze was amazing to work with. If we don't move to Imperial Beach or the greater San Diego area, we'll be back to visit often!! Loved it! Stayed in Surf Passage for a week or so prior to moving next door to Ocean Breeze (to extend our stay since we loved Surf Passage so much.) 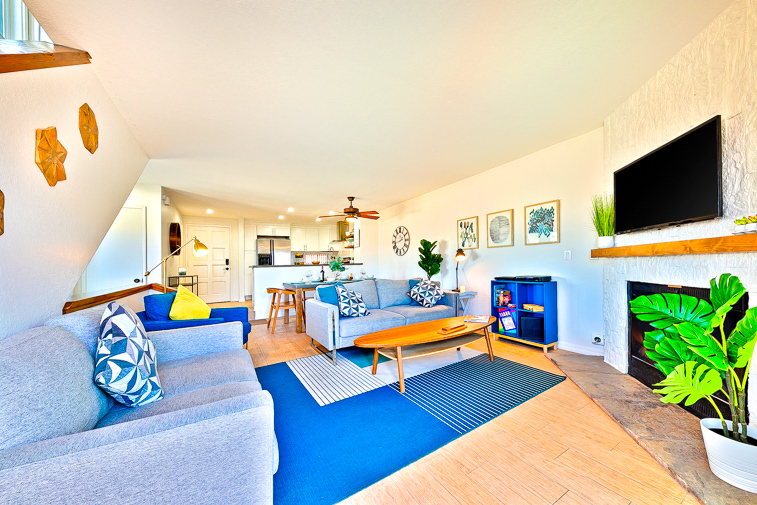 Ocean Breeze was even better (hard to believe since Surf Passage was so great); a bit more updated, carpeting on the stairs was a bit more quiet and being an end unit, there were more windows for more natural light. Kitchen was a bit more organized, though we cooked with ease in both units.